Some time ago, a user asked for help to use the ColumnComboBox as inplace editor for TAdvStringGrid through the EditLink mechanism. While we pointed to example app 24 for a more detailed look into the use of EditLinks, providing a good EditLink for the ColumnComboBox edit control is a little more involved and therefore by helping the user out by providing this EditLink for TColumnComboBox, it is most likely also useful for lots of other users. 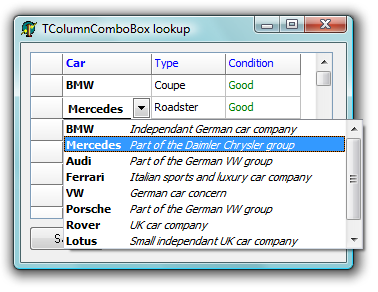 The use of the ColumnComboBox as inplace editor has a simple goal. Extra information (text as well as an image) can be used to provide the user with help or visual clue about the item to be selected. TColumnComboBox comes in just handy for this requirement as it can have a selectable edit column (that is the column that is used to reflect the edit value from), a different lookup column (that is the column used for keyboard lookup) and it can have any number of columns that contain text in different fonts or colors and finally an image from an imagelist can be used to give a visual clue about the items. Most of the work to integrate any control as inplace editor for TAdvStringGrid has been encapsulated in the base class TEditLink. To use a new inplace editor comes down to inheriting a new component, TColumnComboEditLink in this case and implement a few methods. If the inplace editor has a lot of properties, it is desirable to expose the properties of this inplace editor in the EditLink component. This makes it possible to set these properties at design time, saving us again from writing any code to use the control. The CreateEditor method: this method is called whenever this inplace editor is about to be used. The EditLink has an internal reference to a ColumnComboBox instance, and thus, this instance is created the first time the ColumnComboBox is needed. The parent is set to the owning Windows control, ie the grid. Its OnExit and OnKeyDown events are routed to the EditLink EditExit and EditKeyDown handlers. These handlers determine with which keys the inplace editor should hide or move to a next cell. The destructor Destroy: Here the created stringlist for holding the ColumnComboBox items is freed. The SetEditorValue method: Method to set the current value of the grid's cell in the inplace editor. 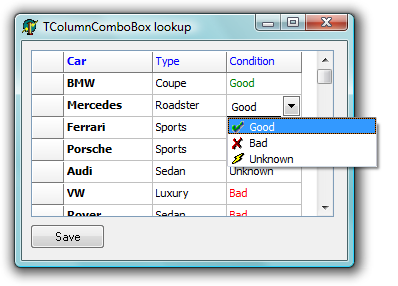 In this case, this value is used to lookup and position the selected item in the ColumnComboBox equal the the grid's cell value. The SetCellProps method: The purpose of this method is to allow setting the inplace editor properties such as color and font equal to the cell's font and color settings, to let the inplace editor seaminglessly match with the cell characteristics. The SetProperties method: This is the main method to control all additional properties of the custom inplace editor. It is called whenever the custom inplace editor is about to be displayed. In case of the ColumnComboBox EditLink this is a little elaborate as a lot of ColumnComboBox properties have been exposed to allowing setting these at design time and the properties must now be used to apply these to the actual inplace editor. As can be seen here, the EditLink Items stringlist is used to set the ColumnComboBox items as well as a ImageList if used. Once the ColumnComboEditLink is implemented, it is ready to be used. For the sample app, 3 ColumnComboEditLink components were used to allow setting up the items at design time without writing code. First requirement is using the OnGetEditorType event to specify a custom inplace editor is to be used and assign the grid's EditLink property to specify which EditLink to use for the inplace editor. Next, some more customization is done from the OnGetEditorProp event. This event is called right after the custom inplace editor is created and thus accessible for further control. In this event, the ColumnComboBox column width, font styles and possible images can be set. Now everything is into place to start having fun with inplace ColumnComboBox editors.